Help! We need to keep our garden watered. Email info@rileyparkgarden.org to sign up for a morning or evening watering time. Thank you, Amy and Atong, for watering our common area and your beds. The whole garden needs to be watered. This is a community garden. There are hoses and sprinklers for you to use. We want to have kids activities in the garden. A couple of the Little Mountain Softball League little players and bed member kids are coming to the garden to get their hands in the dirt. This Saturday, May 26, we have Potato Planting with Anya and Stone Painting with Rebecca. 10-2. The ReWilders were at it again with fifty kits of native plants going to good homes. Thanks to the Vancouver Foundation, we were able to provide plants and education to residents coming to pick up their new trees. Michael led a walk through our Riley Park woodland, 'west beach', and rewilder beds. Tamara shared seed blends for alternatives to regular grass, sedum mats and a living roof, which was installed by volunteers on our Produce Library. Thanks to Nat's Nursery Wholesale and West Coast Seeds for having such great staff, resources and products. I originally started to look for a community garden plot in Vancouver at the start of 2016. Full, full and full. A few of the gardens kept waitlists. One of the responses I got when emailing to get on that list "I am confirming that you are definitely interested in being added to the waitlist as it will be approximately an 8-year wait". Sure, why not was my response. In the end it all worked out, that was my year of hiking every and all weekend. But last year a car accident stopped my hiking in it's tracks and my body and spirit needed something new. By chance, through a friend of a friend, I learned about a new community garden that was being built. Although the plots were reserved for groups, they were welcoming to individual members to help with the garden at large. One weekend at the end of June I joined a work party in the garden and two hours later I was invited to share a remaining garden bed with some other individuals. I rejoiced! Digging in the dirt is better than therapy for me. For the rest of the summer and into the fall, the garden became a place not just to ease my mind and gently move my body, but also where I could find connection with the fellow gardeners, make friends and enjoy the most incredible potlucks I've ever experienced. I've gone there after actual therapy session to regroup and re-centre myself by getting some dirt under my finger nails. I've danced in the garden, read books and of course, grow food like tomatoes, zucchini and herbs. You can have all the plans in the world, but sometimes the universe makes other plans. What I learned is that you should have faith that it will give you something you need in return. When I didn't just want, but needed, a community garden - it appeared. With a community, and friends. I met people (including one of my favorite people in the world) who I would not have met had I not been on this path and who make me grateful that I am. Keep your heart open to new possibilities. 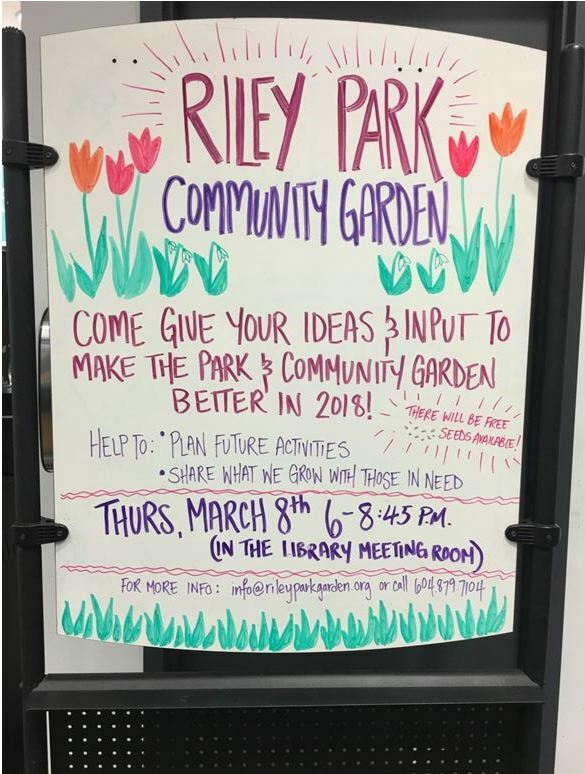 Here's to another exciting year at the Riley Park Community Garden. I will see you there! Do you want to get involved in a community garden? Do you enjoy gardening and want to learn more? Do you want to help organize potlucks, work parties, workshops for kids to seniors, be the friendly face meeting and greeting our garden members? We are hiring 2 students to work this season. For more information email joanne_mackinnon@lmnhs.bc.ca and check out the job description. Please share with your networks. Thank you for funding from Canada Summer Jobs. Attention to all our Garden Bed Members and veggie gardeners. check out the list of seeds we have available for you to plant in your garden bed this season. Thank you to Village Vancouver for providing a lot of the seeds. Also, we will be getting beautiful organic tomato plants towards the end of May/ beginning of June, so no need to start from seeds or purchase any plants. UBC Environmental Education students worked with families with kids under the age of 6 on physical literacy and nature education. They had 4 sessions in the Riley Park Community Garden learning about compost and planted a few vegetables. If you have an idea for education or workshops in the Fieldhouse or using the Community Garden, apply online to use our space. Built by Robin Hastings (our Bartlett Tree Expert on the right), the Produce Library invites community members to help themselves to produce left in this space. Selina Pope, beside Robin on the right, led the Work Party to harvest the fall planted crops. A big thank you to Farmer Chris of One Love Farm who donated the plants and worked with us on their planting. Marta Ramos, our Newcomer Community Kitchen coordinator (on the left) is most grateful to use the produce from the garden in her program. Join us at the Terry Salman Library Branch at Hillcrest Community Centre to learn more about the garden and our activities. Meet garden volunteers, tell us what you want to see and do in the garden and take home seeds. 6pm - 8:45pm. Share your ideas to help grow our garden. Join us for an information session on March 8 at the Terry Salman Branch. Can't come? Please fill out our online questionnaire. Saturday, January 13 10-2 bring your tree to Riley Park Parking Lot and have your tree chipped by Bartlett Tree Experts. Be sure to share with your friends. A by donation event. Monthly donation stations at the Nat Bailey Farmers Market to benefit Little Mountain Neighbourhood House Community Kitchens and Drop-In programs for immigrants and newcomers. 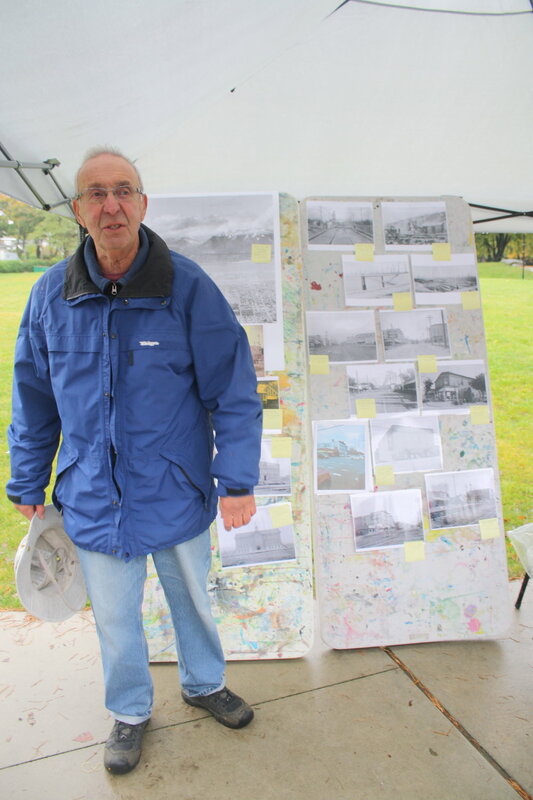 Harvest Party + Riley Park Through the Ages: a Recap! Thank you to everyone who came by and participated in our last "official" work party of the season here at Riley Park Garden! We had an amazing day this past Saturday. Here are the details! The morning started with the UBC Rewilder Group gathering in the garden to transplant the native plants from their garden bed into the communal northern bed. Thank you to the Rewilders for providing coffee, yummy stew, and knowledge about how to "Re-wild" our city's green spaces! Shown below is a slideshow of some of the photos from the garden work party in the morning. The UBC LFS students were hard at work finishing the produce library, and garden bed members were hard at work harvesting and taking out plants. After working hard in the garden, we had a wonderful "Heritage Potluck", where community members were encouraged to share a dish representing their family background. Some highlights included Anya's pierogies, Amy's chicken curry, Mary's cake, and Felicia's soup + crumble. After lunch was the highlight of the day: the presentation on Riley Park Through the Ages! We were lucky enough to hear from Lori Snyder, Dr. Art Bomke, and Allan Buium about how the space has changed throughout the centuries. Thank you very much to these presenters for their time researching and contributing to this very educational activity! 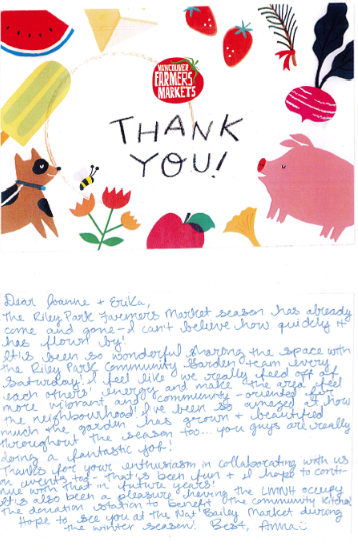 What a great way to officially wrap up Riley Park Community Garden's first growing season. Stay tuned for upcoming events throughout the fall/winter- and especially look forward to our Season Wrap-Up Celebration: November 29th at the Little Mountain Neighbourhood House! September 23rd Recap: Apple Festival! We had an amazing time at Riley Park this past Saturday working in the garden and celebrating apple season! We are so lucky to live in British Columbia, where there seems to be beautiful apples growing in every direction! The sunny, crisp autumn day started in the morning with our weekly work party, led by Peter. We accomplished several tasks, including working on the compost structure, assembling our new wooden entrance signs, weeding, and measuring beds for irrigation plans. We also welcomed the UBC LFS students who will be working with us for the semester! Right after the work party, Norm Dooley presented an apple varietal tasting in addition to teaching us about apples. Norm brought down 8 varieties of apples in bulk from his favourite orchards in Keremous, B.C. Once the tasting was finished, the apple-themed potluck began! There were several dishes, including two salads, baked apples, homemade pastries, and the contest-winning dish: Felicia's gluten-free apple crisp! Other activities happening at the garden during the apple festival included decorating paper bags for carrying apples home, as well as pressing apple cider juice using an old apple press! Thanks to Robin for bringing that to the garden. The wasps were definitely pleased as well! Thank you for everyone who came out and participated! See you next Saturday!